GPT is modern and has many advantages over MBR. However, there are also some issues with GPT booting in Legacy BIOS mode. GPT is part of the EFI specification, of course it will work best in UEFI mode. But maybe it will not be compatible and can not boot up on the BIOS computer, see more here. Microsoft also does not support booting Windows on a GPT hard disk in Legacy BIOS mode. However, in some ways, you can still install Windows on a GPT hard drive even if your computer only supports Legacy BIOS mode. So far, MBR is still supported in both UEFI and Legacy BIOS boot. However, there are several reasons that you must use GPT instead of MBR. You can only create partitions up to 2TB on MBR disks, if you need to create partitions larger than 2TB or the total size of partitions on disks larger than 4TB, use GPT instead of MBR. For 3TB and 4TB hard drives, you can create multiple partitions with full disk space without having to convert the MBR to GPT, see how to partition a 4TB hard drive. 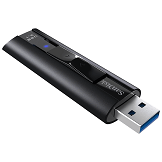 AIO Boot now supports installing Grub2 on GPT disks including both HDD and USB. After installing Grub2, you can boot the GPT disk in Legacy BIOS mode. Windows Boot Manager does not support booting into Legacy BIOS mode on GPT disks. AIO Boot uses wimboot to do this. Install AIO Boot to a partition on GPT disks. The grub-install, grub-bios-setup command on Linux and the grub-install.exe, grub-bios-setup.exe program on Windows require a boot partition on the GPT disk to install Grub2 for the Legacy BIOS mode. 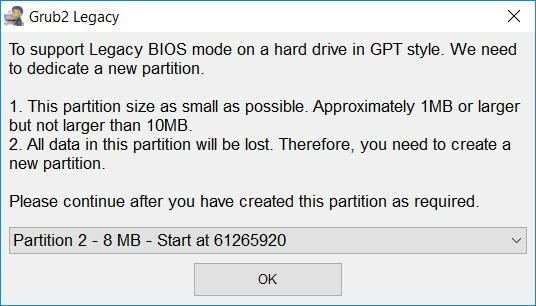 On Linux, this partition will be flagged as bios_grub. We will create a small partition of 1 to 10MB. You do not need to format and do not need to mount the drive letter for this partition. For USB, you can use the MiniTool Partition Wizard to create a second partition. For USB, you can use the MiniTool Partition Wizard to create a second partition. Run AIOCreator.exe, select Grub2 from Bootloaders. The tool will list the partitions that you created in step 2. Select the partition and click OK to install Grub2. Run AIOCreator.exe, select Grub2 from Bootloaders. This is a new feature of AIO Boot v0.9.8.1. It supports installing Grub2 on the GPT hard disk to boot in Legacy BIOS mode without creating a boot partition. Select Install Grub2 (Legacy) from the Tools button. This button only appears when the current hard disk is GPT and the current drive format is FAT32 or NTFS. 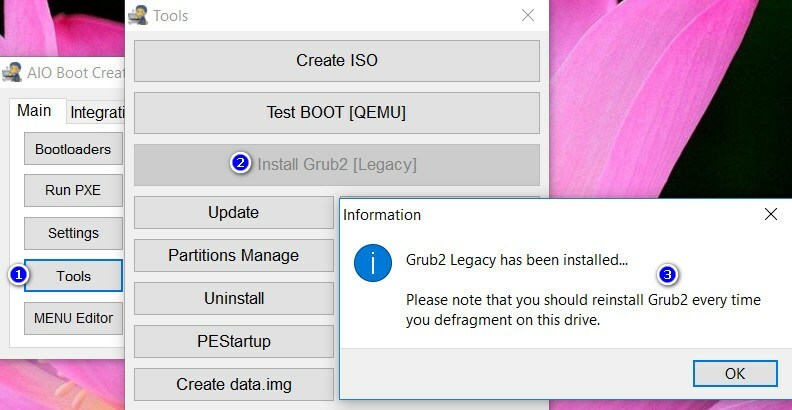 Please note that you should reinstall Grub2 every time you defragment on this drive. Ok, I have 4TB GPT disk. I have created an AIO in a 30GB FAT32 partition of that disk. I have integrated All the Windows installer, right from XP to WIndows 10 (leaving Windows 8 and 8.1) of both the architecture, Hiren Boot CD with PE, and all the version of Acronis True Image, my AIO is booting properly on UEFI system but not booting on purely BIOS system, please suggest me a solution of this problem. Interesting when I create an AIO boot, on flash drive even on a GPT flash drive it properly boots in UEFI as well as on BIOS system but when I create the same on a 30GB FAT32 partition of a 4TB disk it boots only on UEFI system and doesn’t boot on purely BIOS systems. Tu Nguyen>Oh sorry, Microsoft does not allow you to install Windows on GPT disks in Legacy mode. Tu Nguyen>Impossible. You try to install Clover by running AIOCreator.exe -> Bootloaders -> Clover. Tu Nguyen>You can then boot into Grub2 and rEFInd in UEFI mode from Clover. My BIOS is ONLY legacy mode. I want to install Windows 10 X64 in 4TB GPT Disk. If you can make video to show,it is more better. You need to install Windows on a partition on the MBR disk, then clone it to a partition on GPT disk using DISM. Though it didn’t work for me, may because mine is an external drive. You try this and report here, the method uses Clover Bootloader of AIOBOOT. Though it didn’t work for me, may be because mine is an external drive. You can try this method and report here, the method uses Clover Bootloader of AIOBOOT, though this method is for Windows 7 but I think it will work on Windows 10 as well. I have installed AIO boot on gpt hardisk. then I also install windows7 64x on the hard drive using dism – apply image. but the aio boot can not boot my windows. What should I do? You need to create an EFI partition, then use bcdboot to create the boot configuration file. Then boot in UEFI mode. How to boot in UEFI mode if My bios is only legacy mode ? Impossible. You try to install Clover by running AIOCreator.exe -> Bootloaders -> Clover. You can then boot into Grub2 and rEFInd in UEFI mode from Clover. Can you make video for boot into Grub2 and rEFInd in UEFI mode from Clover ? Yes, I probed that. Copy boot.wim from windows installer sources folder to /AIO/Files/WinPE and push the “Boot WinPE via WimBoot”. After I got the installer language chooser menu. But how can I start BCD in this method for loading installed windows to (hd0,gpt8)? Maybe I need to make any method boot.wim which BCD have? Oh sorry, Microsoft does not allow you to install Windows on GPT disks in Legacy mode. I have copied windows partition to GPT disk. This is booting well from msdos partition’s BCD of another hdd. But I like boot from same disk. This was my hope.